Banking with a REWARDS Checking is a simple and convenient way to access and manage your money, while avoiding those unwanted fees to your account. Simply enjoy the benefit of e-statements, and choose to make a monthly direct deposit or swipe your debit card twelve times to avoid paying any fees. Enhanced fraud protection monitoring and much more. REWARDS Checking makes it more convenient to save money with the option to have your cash back automatically transferred to a high-interest savings account. Build your savings without even thinking about it. If that's not enough REWARDS for you…enjoy the access to an exclusive discount program with local and national retailers, regardless of how you use your account. That's it! When you qualify for the REWARDS Checking rewards, you automatically qualify for the high-interest reward rate of REWARDS Savings. If you don't qualify one month, don't worry. You can get back to earning the full rewards the very next month. Safe and convenient way to receive your paycheck and manage your money. Comprehensive 24/7 ID fraud tracking and monitoring. Identity restoration and wallet replacement services that help you replace crucial items, including: driver's license, credit card, debit card and medical card. Enjoy 24/7 access to your account balance, transaction history and electronic statement. Avoid late payment penalties with bill pay. Send, request and receive money with Popmoney by using a Smartphone or email. Make mobile deposits on your own time by using a Smartphone device. Don't let location limit you. Use your debit card anywhere and receive up to $25 of foreign ATM fees. Cash in on rebates up to 30% at hundreds of the biggest brand-name national retailers online. Simply make your purchase and the rebate will be automatically deposited back into your checking account. No mailing in rebate forms. Just straight-up rebates! *Minimum to open account is $50. The monthly fee for this account is $9. This fee may be eliminated by doing the following within each monthly qualification cycle: (1) Be enrolled and receive e-statement notice; and (2) have at least 12 debit card purchases of at least $5 post and settle in your account and/or (3)receive a Direct Deposit or ACH debit in your account. When all three monthly qualifications are met, you receive 5% cash back on debit card purchases that post to and settle the account within the monthly qualification cycle up to a total cash back of $5 per monthly qualification cycle. REWARDS Checking rewards will be credited to your REWARDS Savings account on the last day of the monthly statement cycle. 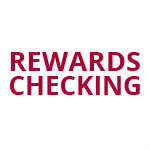 If you do not have a Rewards Savings account the rewards will be credited to your REWARDS Checking Account. Qualifying transactions must post to and settle the account within the monthly qualification cycle. Transactions may take one or more banking days from the date the transaction was made to post and settle the account. ATM-processed transactions do not count towards qualifying debit card transactions. "Monthly Qualification Cycle" means a period beginning one day prior to the first day of the current statement cycle through one day prior to the close of the current statement cycle. Merchant rewards and identity theft protection are available one business day following account opening. Domestic ATM fees incurred during qualification cycle will be reimbursed up to $25 ($5 per single transaction) if qualifications are met within the monthly qualification cycle. ATM receipt must be presented for reimbursement of an individual ATM fee of $5.00 or higher. When you sign up for REWARDS Checking, you're taking control of more than just your finances. Our comprehensive identity and card protection services help protect your personal information. And should anything happen, we will get you through it. If we detect anything unusual, we notify you immediately. If you suspect your identity has been compromised, our Restoration Specialists will provide hands-on assistance to restore your identity while you get on with your life. We contact all affected vendors and/or agencies on your behalf, including credit card companies, credit reporting agencies, Security Administration, and many more. If you lose your wallet, we work with you to replace those crucial items, including your driver's license, credit cards, debit cards, and medical cards; the things you rely on every day.